WOW and gorgeous are just a few words that describe this stunning remodeled 2 bedroom, 1 bath, 2 car garage home sited on a .16 acre landscaped lot with plenty of parking. The open concept kitchen is amazing with NEW granite counters with mosaic backsplash, NEW cabinetry, NEW stainless steel appliances, NEW pantry, under counter lighting, breakfast bar , New sink and faucet & track lighting. 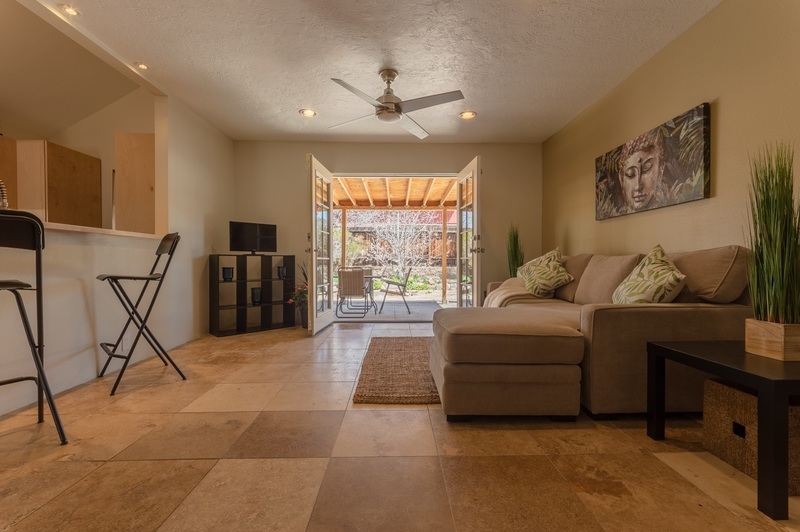 The lovely living room has can lighting and doors leading to the back yard with flagstone patio, fruit trees and a great covered portal perfect for gatherings and barbecuing. The lovely remodeled bathroom has a tiled walk in shower, NEW sink/cabinet, mirror & light fixture. Wonderful extras include: Pex in floor radiant heat-NEW light fixtures-New garage roof-Travertine tile/wood laminate flooring-New combo water heater/boiler-Water line from street & meter replaced-Finished & insulated 2 car garage-Bamboo and fanfold blinds-New Ceiling fans-Storage under the stairs-No carpet- This is a gem of a home. Directions To Property: West On Agua Fria Pass Meadows Rd- Left Into Fairway Village- Left On Village Way To Home On The Left.